There was even a tango!!!! 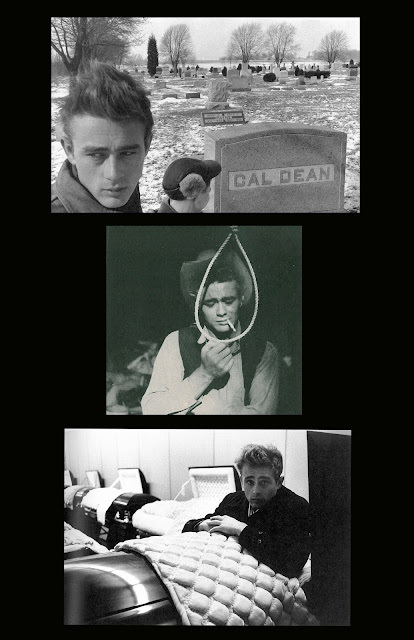 While "La pena de James Dean" (James Dean's sadness) is no masterpiece, not even a classic, Jorge Caldara recorded it with his orchestra, for RCA Victor in 1957. 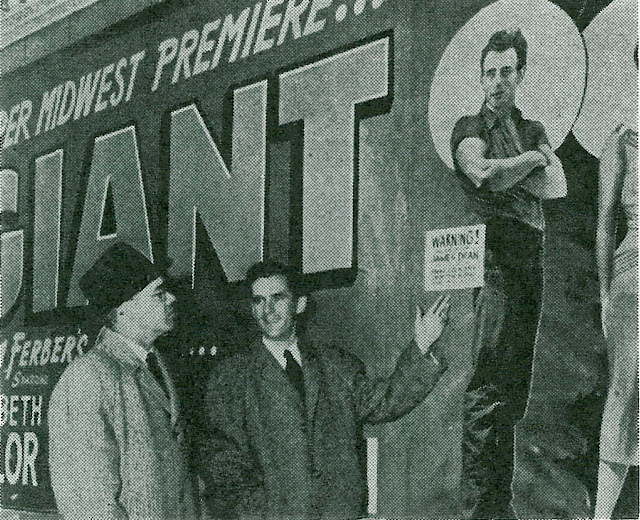 My uncle told me about seeing Giant on its opening weekend at the Fox Senator in Sacramento. The Senator could seat about 2,500 and the only seat he could find was in the last row of the balcony, just under the projector ports. He told me that when Dean first appeared onscreen, an electric murmur of reverent awe swept through the audience that he remembers to this day. 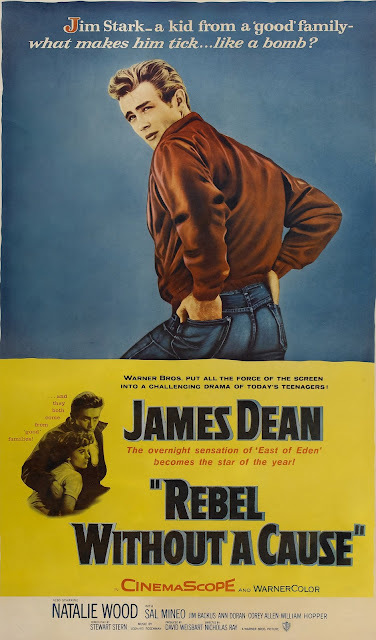 Personally, I still think Dean lived long enough to show his limitations in Giant; his performance is so pinched and inward that it turns the film from a study of the clash between Old and New Texas into a squabble between Rock Hudson and Liz Taylor over how to raise the kids. 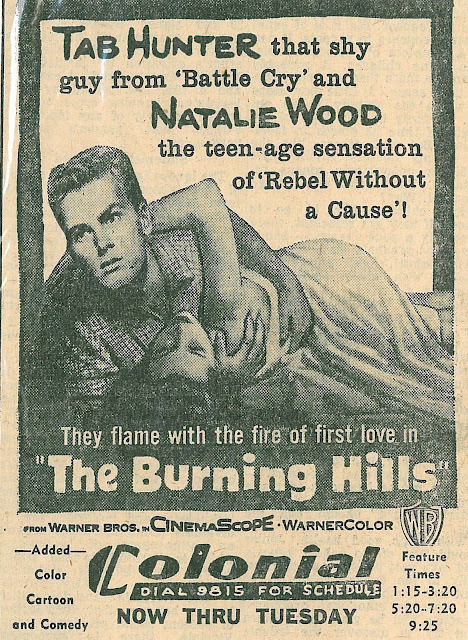 Still, the wave of teen necrophilia that swept America between 1955 and '57 was a sight to see, even for a preteen like me, and has never been repeated -- not that the media haven't tried to gin one up from time to time (e.g., River Phoenix, Heath Ledger). 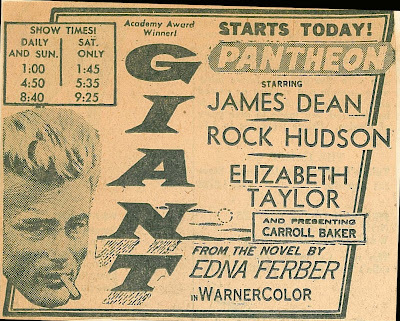 The IMDB claims that Alan Ladd turned down the role of Jett Rink; never heard that before, but it sounds interesting. 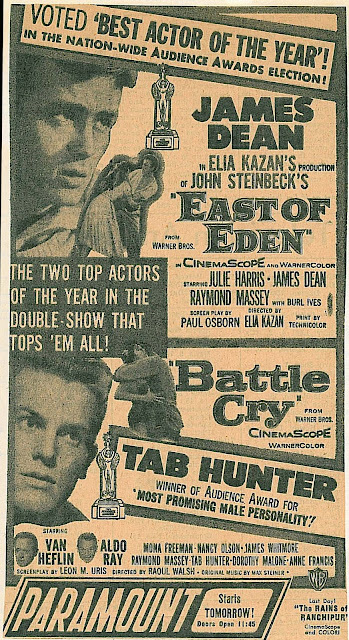 And speaking of Alan Ladd -- I love your new masthead, John, but I can't place the Ladd picture shown on your screen; what is it? Hi Jim --- Glad you like the new masthead. I'll be changing it from time to time with new stills. The one up now is from "The Badlanders". 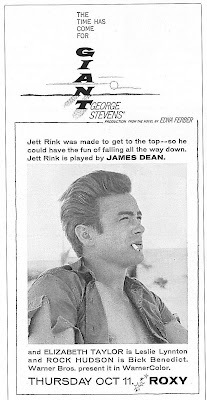 As to Ladd for Jett Rink, I rather wish he'd played it. He'd have been great, I think. The story I've heard is that his wife discouraged his taking it because she said his part wouldn't be the lead. Too bad. It might have given him the same career boost that "Shane" did, again with Stevens directing and knowing how best to utilize Ladd, a great screen personality much under-represented on DVD. So the masthead screen will change from time to time, eh? Do we get to "win" bragging rights by being the first to identify a new picture? 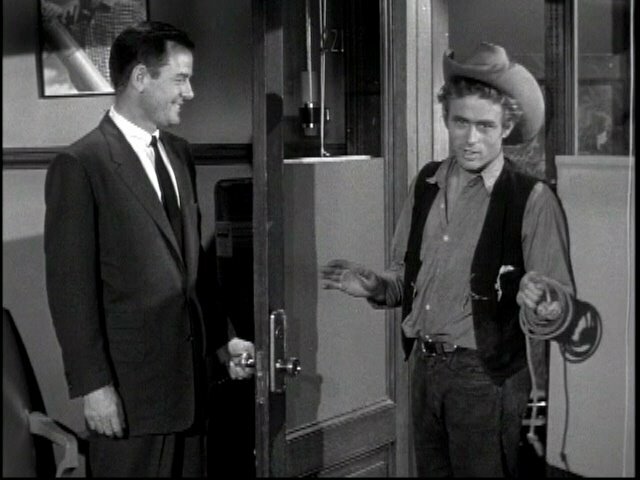 As for Ladd, I too think he'd have been a great choice for Jett Rink, and the story you've heard makes sense to me. It ties in with what I read in that Robert Preston interview I mentioned in my comment to a Ladd-related post of yours a while back. Preston blamed Mrs. Ladd (aka Sue Carol) for ruining his career, prodding him into roles that made him uncomfortable and (if memory serves) badgering him to refuse roles he really wanted. But enough about the neglected Mr. Ladd, and I apologize to your other commenters for changing the subject. 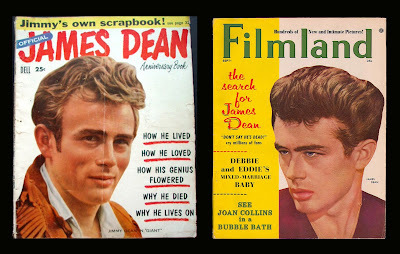 We now return you to the topic of James Dean. Is the author the John McElwee who once lived in North Carolina? I'm still here, Steve. Didn't you and I do some 16mm business about thirty-five years ago? I like the masthead change. 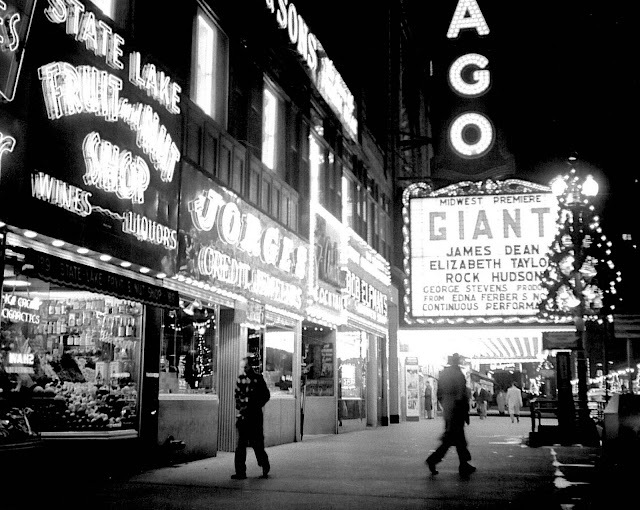 I like that broad theatre in the photo. Everytime I see the character name "Jett Rink" (and I wonder if its intentional on the part of the writers) it makes me think "Rat Fink." 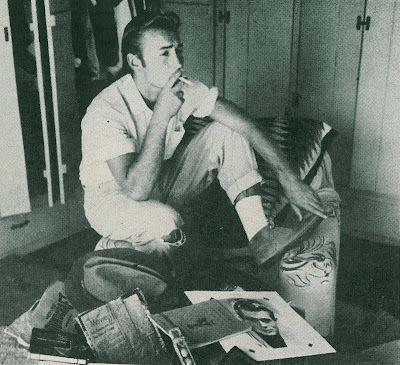 Mr. Lane, I'm really perhaps out of my depth here, as I don't know that much about Alan Ladd's career (except that he was a wonderful personality and really lifted some those Paramonts like "Saigon" into a much higher-level than they deserved!). 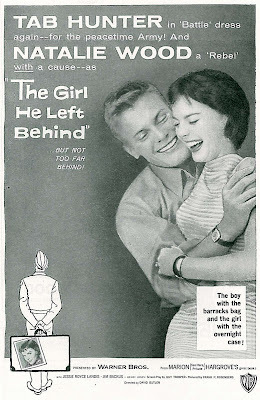 But it is my understanding that Sue Carol, really WAS Alan Ladd, that he was created to her tailor-made specifications. She may have given him "bad advice" from time-to-time (as what agent or manager in this business hasn't?) but at the same time she also gave him his career, and she certainly deserves a hell of a lot of points there! P.S. : I too love your new masthead. I had no idea what film it was from either, but the design really evokes memories of what "going to the movies" used to be all about! Kudos, John. R.J.